Rent a professionally designed and build set for your production of the Sister Act. This set is designed for maximum creativity in presenting your vison of the show. 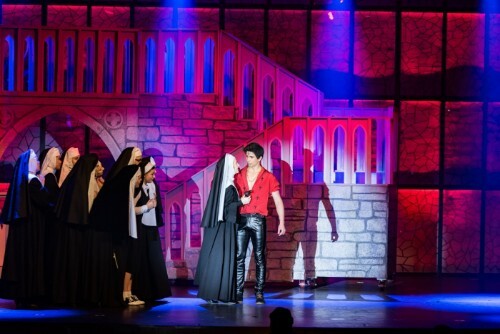 Fourth Wall Scenic offers a versatile Sister Act rental set - a premium set. Designed to evoke the imagery of a cathedral while also playing to the familiarity of the movie and thoughts of the original Broadway show. To find out more about the set details, and to see how it would fit best on your stage, scroll down and find out more. This Sister Act set rental was acquired by Fourth Wall Scenic in 2017. Designed with all the Broadway show scenes and in a traditional Gothic-style, this Sister Act rental set is perfect for theatres and programs with larger stages. As with all of Fourth Wall Scenic's sets, only one 53' semi truck is needed. The set is now available for rental from Fourth Wall Scenic. Also now available, is a costume rental package for Sister Act the musical. Fly System Required: No. Can be flown or wagon mounted. Sister Act Set rental picture gallery. A list of what is included in each rental. Fourth Wall Scenic acquired this Sister Act costumes rental package in 2017. The package borrows styles from the Broadway show, tour and the original designers imagination. The rental package is set up for a cast of 20 nuns plus Sister Mary Roberts. Sister Act rental picture gallery.